When our children are sick to their stomachs, we tend to express some sympathy for the pain they're experiencing – but wouldn't it be so much easier if they knew how to find the toilet? For some reason, many children seem to have trouble predicting when they're going to vomit and don't quite make it to the bathroom when they realize what's going down (or up). There's no reason to get mad if and when this happens. After all, it will likely make your son or daughter feel even worse. Luckily, there are several easy ways to clean some of the raunchiest stains from your carpet or cushions. Cleaning upholstery isn't always as easy as it seems. Instead of simply wiping or blotting right away, you should first scrape away the excess vomit. Use dry-cleaning solvent on a clean cloth or sponge and blot the remaining stain. Just be sure to use a cleaner that won't bleach the colors and leave the upholstery looking worse than before. The carpet requires a little more finesse, especially if it's wilted or raised in any way. After removing the excess fluid, you can sprinkle baking soda (which makes an excellent absorbent) on the stain. 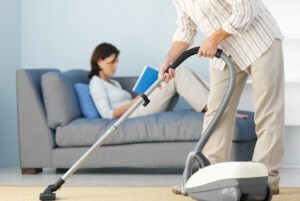 After waiting five to 10 minutes, vacuum the spot before blotting with a thick towel or cloth. As long as you follow these simple guidelines, you can always claim that it's her turn to deal with the fallout if and when the child throws up again.